Driving cars or riding horses on beaches pose a significant threat to shellfish living and feeding in shallow water, research suggests. The research was conducted by New Zealand researcher Gareth Taylor at the University of Canterbury. Taylor, who received his doctorate at graduation this week, has provided management options to local authorities to minimise the impacts of beach users on shellfish resources. 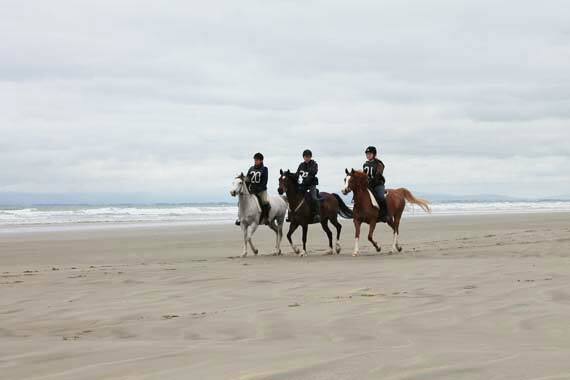 Taylor found that driving cars or riding horses on beaches was killing shellfish. A shellfish known as tuatua were found to be immediately impacted by both users. Taylor said modelling predicted that continued disturbance could be highly detrimental to the population. He said his results were used to evaluate current beach management techniques and provide management options to the regional agency, Environment Canterbury, to minimise the impact of beach users on shellfish resources. While most light leisure activities, such as sunbathing and running, will have no impact on the environment, other heavier activities could. Taylor looked at how beaches can be managed to reduce the impact on shellfish. The intertidal zone, where most people drive their cars on a beach, contains a wide range of shellfish, including juvenile tuatua. In addition to being a food source, tuatua naturally filter the water, reducing turbidity. This helps to keep water clear and clean. “While adult tuatua are in the subtidal area, juvenile tuatua sit in the top 5 to 10 cm of sediment about 30 metres below the high tide line. This is also where vehicles and horses are frequently used. “As a vehicle driver on the beach, what can people do to stop this damage occurring? The easiest way is to not drive on the beach. However, if a vehicle is required there are other ways to mitigate impacts. “Driving within the same tracks made by other vehicles will significantly reduce tuatua mortality caused by vehicles. A heavy four wheel drive vehicle will penetrate deeper into the sediment than a light vehicle. Tyres designed to grab into the terrain such as off-road tyres also displace more sediment, so more mortality may occur, Taylor says. omg is this for real?!!!! Yet it’s ok to remove tonnes and tonnes of west coast beach sand, killing everything in the process for commercial gain?!!!! What on earth is going on with this country.. has logic and common sense completely gone?? ?